We’ve not had much planned these last few weekends, but that hasn’t stopped us being busy. With Saturdays taken up with ballet and football for G, we decided to do something the whole family would enjoy on Sunday, and took baby C for her first ever swimming trip, aged 12 weeks. The first thing to say is how much more difficult it is taking two kids swimming! I take G to a swimming lesson once a week with C in tow which is hard enough work, but even with two of us parents there were clothes getting wet on the floor; one child suddenly announcing she needed to wee, like, now; another deciding they were hungry; and of course we didn’t have any 20p coins for the lockers, all whilst squished into a couple of tiny changing cubicles. Note to self, next time wait for the family changing room to become free. Overall though, I’d say it was a tentative success. G ran into a friend from school and chattered her way through most of the trip, and C didn’t shed a single tear, even when I decided it was time to start her getting used to having water splashed over her face (partly to disguise the fact that she’d just been sick in the pool, more than once – shhhh!). 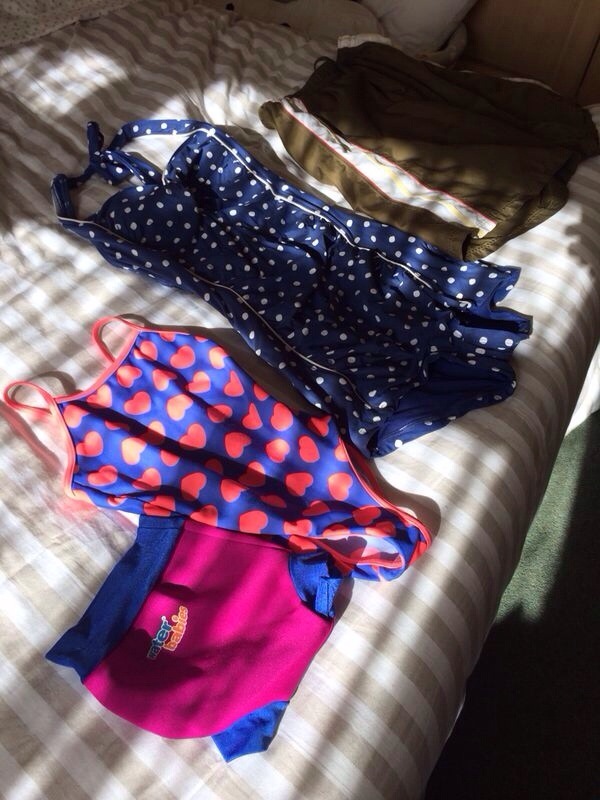 I stopped short of trying out some underwater swimming with her, which we’d done with G in her baby swimming lessons years ago, though I was curious as to what reaction I’d get from the other parents if I did…one to try next time! After the reverse manoeuvre of getting everyone out and dressed we definitely deserved the giant carvery roast dinner that we went and wolfed down. C, quite understandably, slept soundly right through that bit, and indeed slept pretty soundly last night too (6 hours! 6 hours!). For that reason – if nothing else – I think we’ll try swimming again one day soon. C and I went on a flying visit to the Baby and Toddler Show at Manchester’s grandly named Event City today. A little white lie to the parking attendants directing people to the furthest overflow parking (yes, I’m a bad person ) and we were soon parked up outside the Trafford Centre’s Barton Square ready to go. It may not be a patch on the huge shows in Birmingham and London, but given we live close by it was worth a quick trip down the road fora number of reasons. Firstly, I had a voucher for 50% off a Bambino Mio Miosolo nappy. I’ve already written about my cloth nappy addiction, and whilst it’s not my current favourite nappy, I’ve been very impressed with the Miosolo – it’s held up to some pretty epic poosplosions, is pretty quick to dry and the attached insert is simple to stuff and much easier than hunting out a matching insert from the washing pile. Secondly, I was fed up of hunting through baby swimming class websites trying to find one I can get to with C inbetween school pickups, ballet, football and so on. All the main class providers were there, and it was great to see G’s first ever Water Babies swimming instructor again. I was also excited to discover that Rebecca Adlington has set up a swim school in Bolton – guess what I’m enrolling G for ASAP! 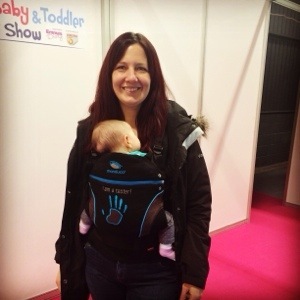 And finally, I got the chance to meet Rachael from Kangarinos who was there with Cheeky Rascals giving me the chance to try out a Manduca carrier around the show (pictured!). I’ve been looking for something quick and easy to pop C in for the school run, and the Manduca is definitely a contender, particularly as they’ve released a limited edition purple version. Purple! Back home, a brief look online reveals the worst. No, not anything wrong with the Manduca carrier – it simply appears that the world of ‘baby wearing’ has the potential to be just as addictive as cloth nappies.